The MCN Sport Season Review 2017 special is packed with eye-popping pictures and inside stories from one of the most thrilling years ever. There’s a blow-by-blow account of the 2017 MotoGP season where five star riders fought for the title for the opening rounds. You can also see how Marc Marquez finally overcame the incredible challenge from Ducati’s Andrea Dovizioso. Valentino Rossi made a remarkable recovery from injury and Johann Zarco stunned the world by leading from the first lap on his first premier class race before falling on lap six. We get to know Franco Morbidelli, the new Moto2 Champ and look at how 20-year-old Spaniard Joan Mir decimated the Moto3 field in 2017 ahead of his move to Moto2 in 2018. We look back on an incredible road racing season that saw Guy Martin go to Honda, and leave again, while team-mate John McGuinness suffered a huge crash at the North West 200 ruling him out of the 2017 season. We talk to McPint about what comes next. There’s highlights from this year’s TT; Hutchy tells us how he intends to be fit for the 2018 TT and we celebrate Bruce Anstey stunning the road racing community by fighting favourite Peter Hickman right to the line to win the Ulster GP. Despite Shane Byrne making it six BSB titles this year, we find out why he still thinks he had a 's**t season'. We crunch the numbers of every round of the championship and talk to Leon Haslam about that crash that ended his title hopes. Becoming the first rider in history to claim three back-to-back titles, Jonathan Rea scored a WSB hat-trick in 2017, we look at the race stats that helped him break this record. And the surprise of the year, was in the Dakar Rally with Brit Sam Sunderland only hoping to finish the race. Little did he expect to come home in first place! 2017 was unkind in many ways, with the loss of three motorcycling greats. We look back at the careers of Nicky Hayden, John Surtees and Angel Nieto (the man that turned motorcycle racing into a Spanish sport). 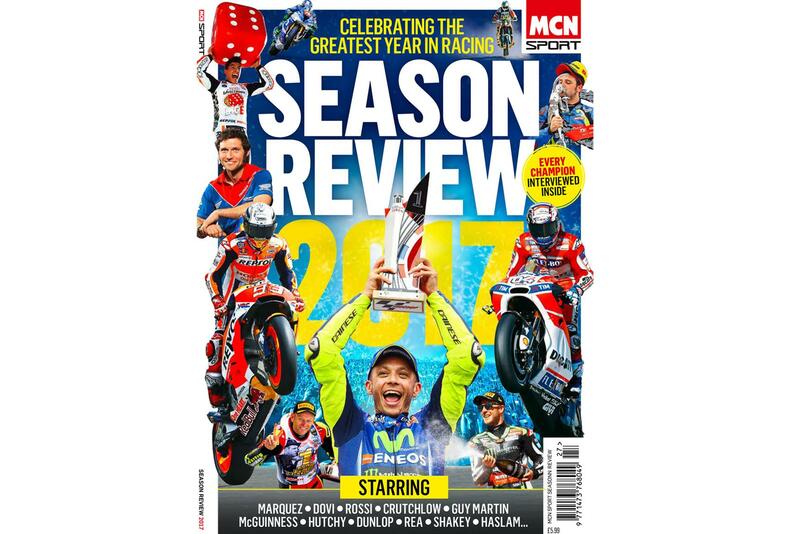 MCN Sport Season Review 2017 is on sale now in all good newsagents for £5.99 or you can order online and get free UK P&P. Is Michael Dunlop your 2017 MCN Man of the Year?